This southern pecan pie recipe has NO corn syrup. To make this pie stand out even more - add a teaspoon of bourbon (to taste) and make it in my walnut pie crust (link below). Heaven on a fork. More homemade pie recipes at the end of the page. In a large bowl, beat eggs until foamy, and stir in melted butter. Stir in the brown sugar, white sugar and the flour; mix well. Last add the milk and vanilla. Pour into an unbaked 9-in pie shell. Arrange pecans on top. Bake for 10 minutes at 400 degrees, then reduce temperature to 300 degrees and bake for 30 to 40 minutes, or until the top of the pie cracks. 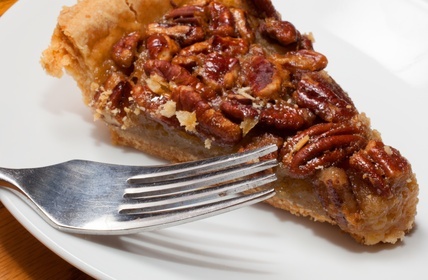 This recipe for pecan pie uses dark corn syrup, which you may make yourself. Just click on the link below. In a medium saucepan, combine the sugar, corn syrup, butter, water, and cornstarch bring to a full boil, and remove from heat. 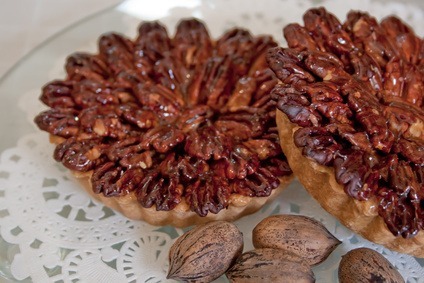 You may also make Pecan Pie Tartelettes. Just fill them and arrange pecans on top. Lovely for individual servings. I love these topped with Bourbon whipped cream. Delicious. I have more than a Southern Pecan Pie Recipe, please check out more recipes below.